If you are in search of a superbly entertaining slot game with a smooth interface, you shouldn’t look for any other slots apart from the fruit-themed ones. One of the favorable online slot games people look into is Fruits Kingdom developed by a well acclaimed UK developer Euro Games Technology. When the online casinos are compared to the land based ones, people generally prefer the former, which eventually attracts more players to the world of online gambling. The fruit themed lovers will surely relish this awesome slot game since it is packed with several intriguing features, in addition, the royal interface which this game hold. 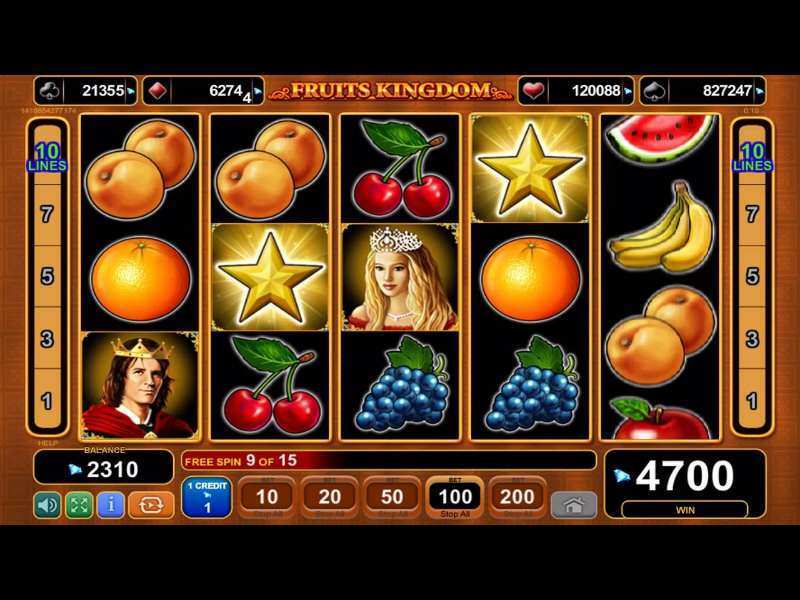 Fruits Kingdom slots have 5 reels and 10 active paylines with a simple solid background over which the symbols appear and the reels turn after they get triggered. The players get a privilege to adjust the paylines according to their need and choose the bet amount accordingly to maximise their winnings. The reels begin to roll as soon as the player selects the bet value. For the reels to spin uninterruptedly, the player needs to select the “Autoplay” option. Coming to the list of symbols which this slot game comprises of are some luscious fruits like watermelon, a bunch of grapes, a pair of cherries, lemons, plums, oranges, apples, and bananas. Other symbols which give a royal touch to the slot machine are a beautiful blonde queen and an ambitious king. Like many slot games, Fruits Kingdom online slot machine also comprises of wild and scatter symbols. The crown when appears on the pay line substitutes the other symbols which clearly demonstrates that the crown is a Wild Symbol. The Scatter Symbol is denoted by the star symbol. The best thing about this slot game is that one can play free Fruits Kingdom casino slot machine irrespective of the gaming capabilities a player possess. Fruits Kingdom also provides various additional features like Jackpot Cards, Free Spins round, and Gamble Feature. In order to play this game, there is no need to download this game since it is a no download slot game. Fruits Kingdom is undoubtedly one of the best slot games which a player can play free of cost since there is no requirement to spend any real money to begin the gameplay. This slot game has one of the generous payouts for its players and they can take full advantage of it. The fruity symbols like lemons, plums, cherries, and oranges do pay a maximum of 2000 coins. A maximum of 2500 coins is rewarded whenever bananas appear on the pay lines. Fruit symbols like grapes and watermelon give out 5000 coins at the maximum. A huge 8000 coins are paid at the maximum if the apples appear on the reels of the slot machine. Finally, a whopping 15000 coins at maximum are given out to the luckiest of the players whenever the king and the queen appear on the pay lines. Coming to the wild symbol which is represented by a crown renders you an enormous payout of 200000 coins. The scatter symbols also tend to provide 100000 coins and moreover when 3 or more symbols appear, the bonus of the Free Spin feature is triggered. There is an option of tripling the winnings thus allowing a chance to receive 15 more free spins. There is an additional bonus round in addition to these huge payouts from the various symbols which is the Jackpot Cards. This bonus round lets you select the color of a playing card which is either red or black. Once guessed right, the player’s winning coins automatically get doubled. Continuous prediction is the key to this round since a wrong guess would terminate the bonus round. The icing on the cake of Fruits Kingdom is that there is absolutely no requirement to deposit a particular amount of money to begin gaining these coins through the high paying symbols. It wouldn’t be wrong to conclude that the Fruits Kingdom has become quite popular among the players mainly because of these excessively high rewards along with several special rounds to augment the coins section of the player. It simply doesn’t have a king and a queen as its high paying symbols, thus making it the king of several slot games present in the online gambling. Euro Games Technology has created this slot game with a very vivid picture of providing several benefits to the players to form a strong customer base. 0 responses to "Fruits Kingdom Slot"